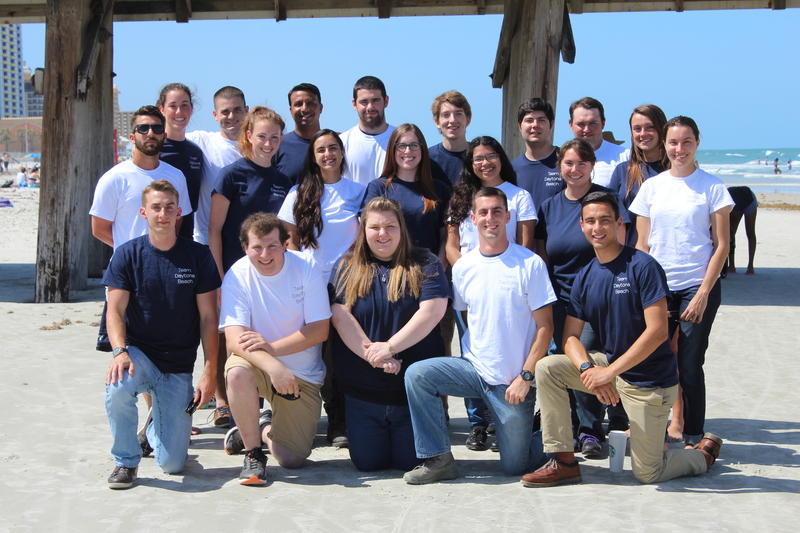 For the U.S. Department of Energy Solar Decathlon 2017, Team Daytona Beach’s BEACH House meets at the intersection of South Florida history and innovative design. Targeting future Gen-X retirees, this “forever home” is designed to have universal appeal for a small family with the desire to live sustainably without sacrificing comfort. BEACH House incorporates colors and art deco details inspired by the renowned Hemmingway House. It also includes Americans with Disabilities (ADA) compliant features and a ductless HVAC system designed to keep the Florida home cool using a fraction of the energy typically used. The design also features a hydroponic garden that uses collected rainwater to grow leafy vegetables and herbs without impacting Florida’s water systems. Team Daytona Beach was inspired by the rehabilitation of their home city. The team wanted to design a house that exemplifies the sustainability of new construction with the distinct style of old Florida. The team also wanted to design a home that meets the needs of the growing senior demographic, but that also appeals to the city’s current homeowners. BEACH is an acronym for Building Efficient, Affordable, and Comfortable Homes. These attributes, chosen because they meet the needs and desires of the target market in Daytona Beach, were used throughout the design process to guide the team’s decisions. Because The BEACH House targets an aging demographic, accessibility is also an important part of the house design. Team Daytona Beach believes that sustainability, at its core, is about meeting the needs of today while at the same time, not sacrificing the needs of tomorrow. This concept is the foundation of the “forever home,” allowing the homeowner the freedom to grow and stay in their home as long as they wish. BEACH House draws inspiration from Ernest Hemingway’s 1930s home. A hydroponic garden includes an air-lift system to move water. Use of a ductless HVAC system with three separate zones is intended to create more targeted and less wasteful climate control in the house. The “forever home” design allows occupants to stay in their home over time even as their needs change. Like many coastal Florida cities, Daytona Beach is a retirement destination. The demand for senior-friendly, single-family homes has increased as the Baby Boomer generation moves away from traditional senior housing. Generation X-ers are expected to follow the same trend as they move into retirement. In addition, Baby Boomers and Generation X-ers are more likely to care about sustainability and green living than past generations. The BEACH House provides an energy-efficient and sustainable solution for this housing boom by combining forward-thinking age-in-place design with passive energy-saving architecture and old Florida style. In addition, the home is designed to accommodate occupants’ needs as they age. The house will go to the Orlando Florida National Homebuilders Association in January 2018; at this time, the home’s final destination is yet to be determined.